When supermarkets get in the big guns – and I’m talking BIG BIG, such as celebrity chefs like Heston Blumenthal - you immediately expect big things. It’s only natural! A top chef by trade, Heston can be seen Blum-ing everywhere! Which is no bad thing as the reviews of his produce are normally top notch. But let’s not get ahead of ourselves here... you can read reviews of Heston’s recipes or books wherever you want, but if you want to know about his pies then you need to be on the home of the pie review - www.pierate.co.uk! It’s just that simple! So when I heard some glowing reviews of Heston for Waitrose mince pies from last year, I had to get my hands on a box (or two) for our '12 Pies of Christmas’ video and naturally submit a review on Pierate. I picked up the Puff Pastry Mince Pies from a Little Waitrose in Birmingham (which will only feature externally in the “12 Pies of Christmas” video, as the media team at Waitrose never replied to my email about filming in store). At £2.73 per box of 6 (that’s 45.5ppp), they seemed rather pricey but I was hoping they’d live up to the cost. 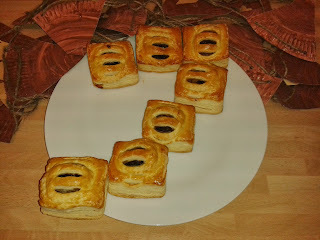 The Mince Pies “Heston from Waitrose” feature in our '12 Pies of Christmas’ video! I opened the box to find the six pies alongside a packet of pine sugar, something I’d not come across before. It did suggest on the packet to warm the mince pies up slightly before sprinkling on the pine sugar but as we were doing our “mince pie rating demo” with mince pies straight from the box, a sprinkle of pine sugar was added to the cold pie. The first impression – I have to admit – was “Have I just been given a mince pie box with sausage rolls in? !” For I don’t know about you, but the shape of these pies did not look like any mince pies I’d ever seen before! However this in and of itself would not detract from the scoring of the pie per se, as the filling was still fully encased in pastry with clearly defined base, sides and lid. A quick bite into the pie and I could immediately tell this pie hadn’t quite got the pastry:filling ratio right in my opinion. The first bite was pretty much all pastry and unfortunately the cross section tells its own story with too much pastry on the sides, top and bottom. Some may also query why this pie had a puff pastry lid to, as this isn’t usually the pastry use for mince pies, but I didn’t have a problem with that. I though the puff pastry tasted quite nice and a good alternative to the typical short crust, but it was a little dry and the amount of pastry made it a bit chewy. 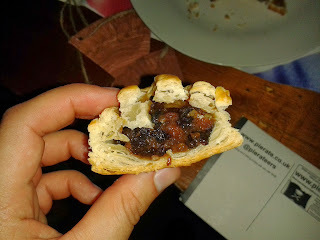 The mincemeat itself tasted nice, with a strong fruity flavour included in the recipe. The content was nice and fruity, however it was clear that there wasn’t really enough of it when you ate the pie. The pine sugar to add to the top didn’t really do anything special for me either, however fancy it sounded to be adding it. Ultimately I’d rather have a well filled pie (which the puff pastry lid didn’t really provide due to a reasonable air gap) than a fancy pie sprinkled with pine sugar. While I’m sure Heston’s mince pies will be a talking point around many a Christmas table this year, for the price involved and the ratio of pastry:filling it certainly isn’t the highest scoring mince pie, despite the big name.